Very different perspectives exist on this topic. 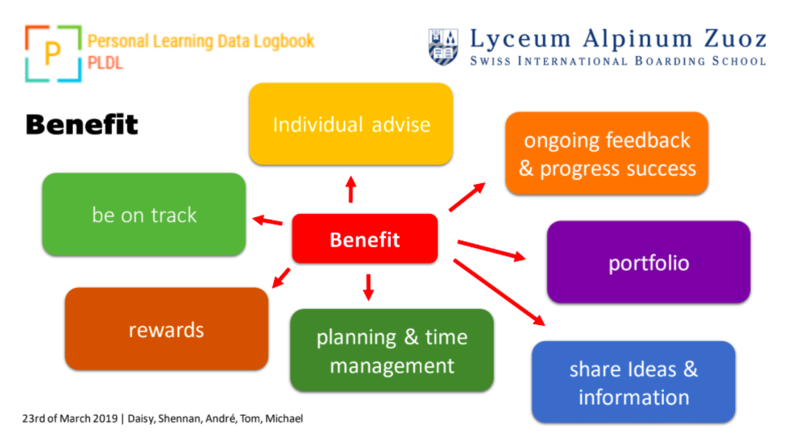 The first question was: What's a learning data logbook? Students perceive AI topics as creepy. They needed to be convinced that it can be a good thing. Fun & colors are important to make products attractive for students! Students have a clear opinion on what's good and what's bad. E.g. OneNote (too many functions) or UniFrog are terrible, but they have to use it. On the other hand, bear (also a personal notebook) is great to them. On one hand an app or website shouldn't have too many functions, according to students, but they still want all functions for their logbook. A logbook needs to combine all important datapoints and it should have a bot for interaction. We created mindmaps to document the benefits and content. We invested a lot of time in understanding the students perspective and preferences. A design of such a logbook has been created. What's the problem you want to solve and why? Enable students to record and use their learning data in a se-cure way with a Personal Learning Data Logbook (PLDL). Many universities and further education institutes provide digital and virtual learning environments (VLEs). In recent years a new direction has been to extend these to support personal develop-ment planning (PDP) and student portfolio management. How can a personal data logbook support me in my lessons and future aca-demic and professional development? What's the solution / project you are suggesting? A PLDL collects and stores all data recorded or generated by a student using digital and virtual learning environments. The student manages access rights for teachers, parents, school management, and others to selected data domains of his/her PLDL. Therefor the PLDL is not only a oneway personal learning data store but also a shared data container to analyse learning achievements and discuss and define future individual (personalised) learning improvement measures (personal develop-ment planning (PDP)) respecting student privacy. The PLDL also helps the student to establish a personal portfolio (e-portfolio) for both educational and professional applications. The PLDL has a generic architecture to provide data collection from different sources as well as data export to different platforms and longterm data preservation. How could this idea be developed or tested at a 30-hours Hackathon? In a first step vision, purpose, context and principal privacy aspects of the PLDL will be defined. In a second step 3 to 5 PLDL use cases will be specified and discussed (PLDL users are students first hand but also teachers, parents and school management). Third different (high level) functional aspects of a PLDL related to the use cases will be designed e.g. a personal learning data analysis workbench, a data access control panel or data collectors (API). Fourth the results of steps 1 to 3 and the use of a PLDL will be discussed and future perspectives / next steps for a LAZ PLDL will be developed.